Since last year I’ve been wanting to try via ferrata, but the idea was always dismissed by the bear (a.k.a our via ferrata expert here :p) by reason of my lack of stamina. Not only that the climbing activity requires a very good physical fitness, but reaching the ferrata route itself usually requires some hiking. It’s not like a helicopter would drop us at the start of the route, then pick us up after we are done :p. That’s why the bear was hesitant, because he thought I’m not fit enough to handle the long and tedious journey. However, this summer, somehow he is convinced that I’m now able to do it (thanks to poweryoga ^^). So here we go! He picked via ferrata Masarè for this beginner cat (not goat). The difficulty level according to the Fletcher/Smith rating is 2C, and B according to the Hofler/Werner rating, explanation of the ratings can be found here. 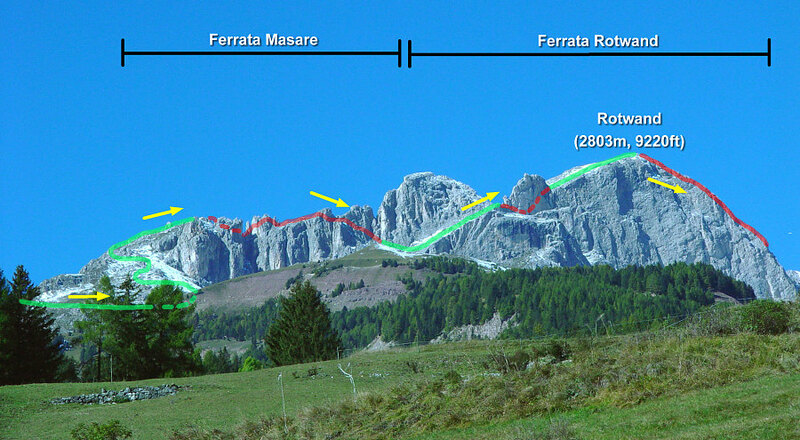 The picture above depicts how the route is going, the green line is basically the hiking route, and the red line is the ferrata route. The bear’s original idea was to do both routes, Masarè and Rotwand/Roda di Vael. But… we didn’t have enough time, and the cat didn’t have enough stamina ^^; So we turned back after completed the Masarè route. According to the website, ferrata Masarè takes approximately 4,5 to 5 hours for the whole trip, and we did it in almost 7 hours :p.
There you go, the 360-degree-panorama taken from the top of the ferrata. And here are some more pictures from the trip. Aside from strong arms and steady feet, I think concentration and focus are really needed to avoid falling. Towards the end, I was exhausted, it was really difficult to maintain my focus (negative feeling started to creep in my brain) and my legs were shaking. But yeah, resting a while before continuing helps a lot, it’s not a race :). In the end, you just have to keep going and don’t panic! So, how do I feel? Accomplished!